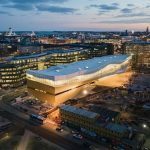 Oodi – a new central library for Helsinki will open on the fifth of December 2018, a day before Finland marks its 101st anniversary as an independent country. 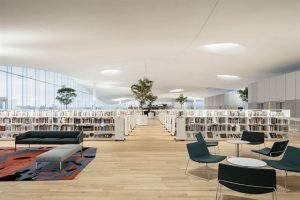 Described as the nation’s birthday gift to its citizens, the 17,250 sq m library has been designed by Finnish architecture firm ALA Architects, led by Juho Grönholm, Antti Nousjoki and Samuli Woolston. Oodi Central Library embodies a new era of libraries in Finland and responds to the country’s 2017 update of its public libraries act, which established a mandate for libraries to promote lifelong learning, active citizenship, democracy and freedom of expression. Oodi is located opposite the Finnish Parliament, a site chosen to symbolise the relationship between the government and the populace: with their two houses facing one another across a civic square surrounded by institutions of the arts and culture including the Kiasma Museum of Contemporary Art, the offices of the Helsingin Sanomat Newspaper and the Musiikktalo Concert Hall. The design and programme of Oodi embraces technology to create new opportunities for access to books and culture. Only one third of the space within the library is used to hold books – a relatively modest 100,000 volumes at any time – however thanks to online services and a team of book-sorting robots, users of the library will have access to nearly 3.4 million items at the click of a mouse, making Oodi the principal service point within a much larger, distributed library system. Oodi is supported by the already well-established HelMet online library catalogue and ordering system, which gives access the Helsinki Metropolitan Area’s full collection. The shift in priorities away from storage of a large static collection of books meant that Oodi’s librarians and designers were able to reconsider the role of the library. By entering into an extensive programme of workshops and consultation with library users, they chose instead to explore new and more inclusive ways of creating access. The resulting library is an indoor extension of public space, a civic “living room” that offers facilities such as a movie theatre, recording studios and a maker space, access to public services, exhibitions and community events in addition to books. “Library services are an investment in people. By developing our people we are preparing our society for the coming era, where knowledge, ideas and culture are the commodities that a successful city will trade with the world. The principle that knowledge is for everybody is a long-established component of the success of Finnish society and essential foundation of a city built on trust between government and citizens. “Oodi is a project that was born out of a long and detailed process of asking what a library could and should be. In consultation with our lawmakers, our colleagues and our users we have sought these answers collectively, making democratic decisions that support the needs and respect the rights of everybody in our society. The design for Oodi was chosen following an anonymous international competition that attracted 544 entries. The winning design, completed by Finnish practice ALA Architects occupies a hugely significant unoccupied site, one of the last remaining in Central Helsinki. The swooping structure of the library, clad in planks of Finnish spruce timber, seeks to extend the public space of the civic square into the enclosed public space of the library, creating a covered canopy that blurs the boundary between the two and a balcony that allows library visitors to look across the square onto the national parliament building. Finland was ranked the world’s most literate nation in a 2016 study (*1). 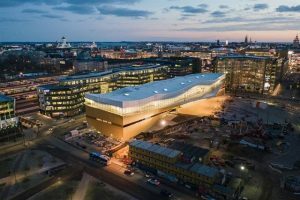 The €98 million Oodi project will become the flagship of Finland’s internationally renowned network of public libraries, setting a new precedent for the future development of libraries around the World. Public Libraries play a central role in Finland’s civic life. Access to public library services is a statutory right for all citizens and Finns are amongst the world’s most enthusiastic users of public libraries: the population of 5.5 million people borrows close to 68 million books a year – just over 12 items per person. Finland spent €57 ($65.4) per citizen on library services in 2017. This compares with $39.34 in the US (*2). Finland was named the world’s most literate nation in 2016. In the early 20th Century the leaders of the newly independent country embraced the public library as an investment in human capital and as a means to promote education and economic development in a region without a wealth of natural resources or an established industrial base. Today, Finland is an advanced economy but access to public library services remains a statutory right, protected in law. Finland’s first Library Act was passed in 1928 and was most recently updated in 2017. The act creates a mandate for libraries to create equality of access to culture, to promote lifelong learning, active citizenship, democracy and freedom of expression. Public Libraries in Finland have begun to explore a broad range of services in addition to the core activity of lending books. It is not unknown for Libraries to provide amenities that range from music rehearsal and recording facilities to community space. Oodi’s Maker Space, equipped with technologies such as 3D printers is a recent innovation that extends the tradition of lifelong learning by giving citizens the opportunity to access and experiment with new technologies that will shape design and manufacturing in the digital economy of the 21st century. Libraries in Finland have also expanded into the sharing economy, offering users to borrow physical items, such as sports equipment, power tools, dinner services and other items of occasional use. Finland used its 2018 contribution to La Biennale di Venezia Architettura to stage Mind Building, an exhibition that tracked the design of Public Libraries in Finland from the years before independence to the present day. Under Finnish law, the budget for every new public building needs to include a “percent for art” – meaning that a certain percentage of the total budget is required to be spent on public art. 100 000 euros were spent on public art at Oodi. Oodi’s percentage art is coordinated by Helsinki Art Museum HAM, who commissioned Finnish artists Otto Karvonen and Jani Ruscica. The art work by visual artist Otto Karvonen is a dedication to the library’s users. Placed in the library’s public staircase, the piece is composed of words describing different population groups, collected through a public campaign and selected by a jury put together by the artist. The design of Oodi has been heavily influenced by consultation with users and experimentation in branch libraries around Helsinki. By asking users how they used the library, and what they hoped libraries would help them achieve in the future, Oodi’s planners were able to reprioritise space in the library, giving more space for events and participation. Oodi’s progressive cultural programme is complemented by the way the librarians that run the library have organised their work. Each of the teams within the organization has a degree of autonomy, with the ability to make collective decisions through a staff vote. Matters that affect the whole library are brought before all staff members before a vote is held.